It’s been a long time since I updated you guys on my FAMI investments so I thought it is just ideal to create a quick post. 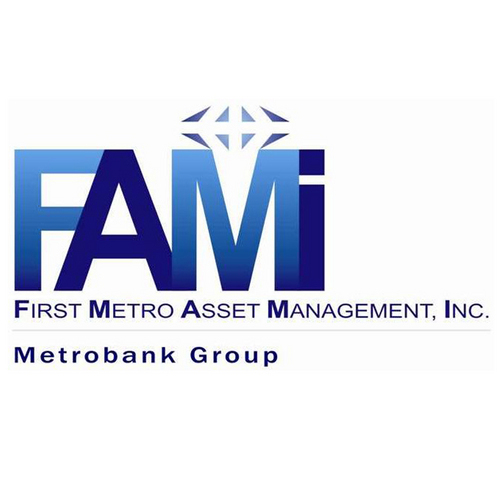 I am still part of the FAMI investors and just before June ends I received an invitation to join the 2015 FAMI Annual Shareholder’s Meeting. Sadly, I wasn’t able to attend because I already have an scheduled event. 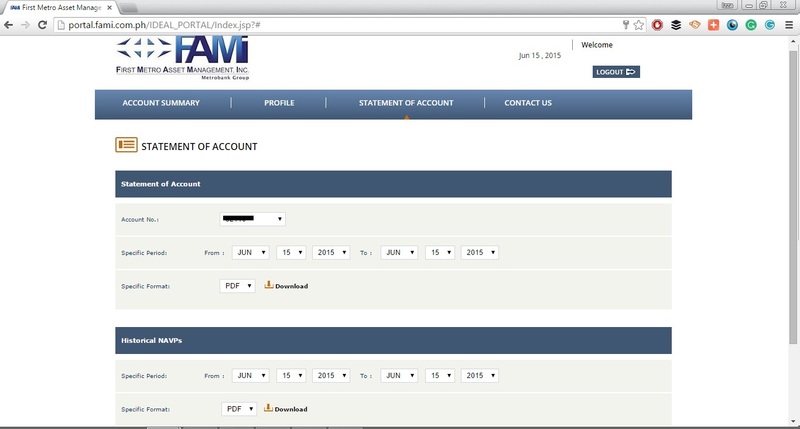 Aside from the Annual Shareholder’s Meeting, I also recently found out that FAMI had an overhaul of their Investor’s Portal. And this is post is a special guide I created on the new FAMI Portal. 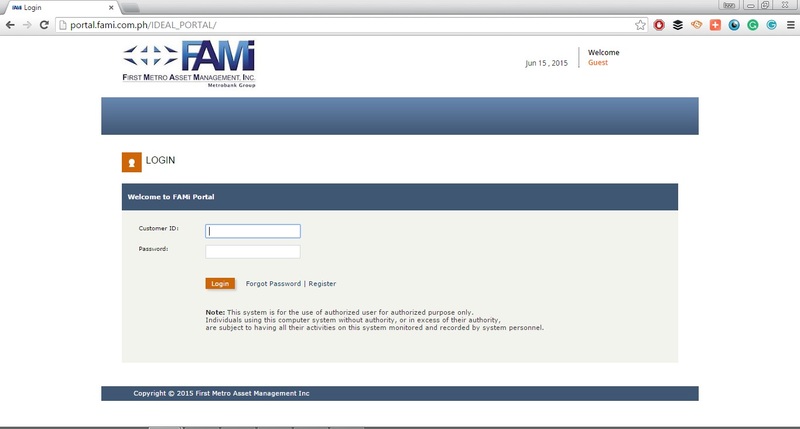 What the FAMI Portal Is All About? 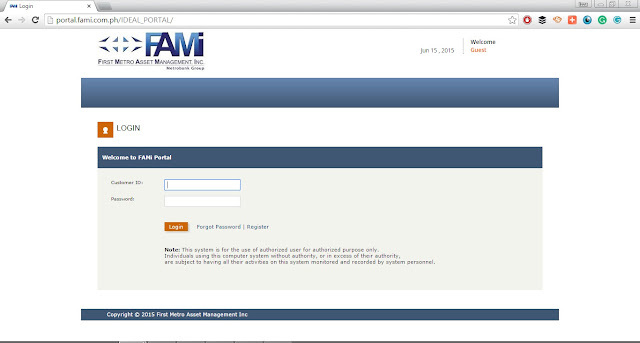 Once you become a FAMI ivestor you now have an access to your very own FAMI Portal. It is a designed to help you track your investments and progress by a website. You will have your Customer ID and Password (which is very difficult to create by the way and needs to be replaced every month for security purposes). It basically function as a quick dashboard that is very helpful to every FAMI Investors. Then click “REGISTER” beside the Forgot Password link. 3. Fill in the details on the Registration Form. 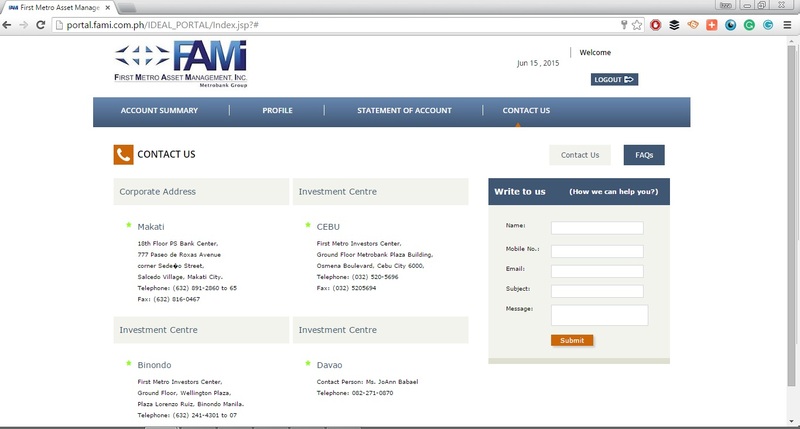 Note that the Client Account Number refer to your Statement of Account (SOA) at the topmost right. 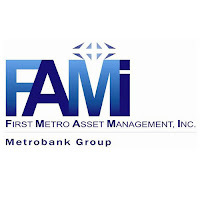 If you haven’t received an SOA yet, just email FAMI atfami@firstmetro.com.ph. 4. Click Submit and follow the next instruction. 5. If your application is successful you will receive an email from fami_online@fami.com.ph for your username and initial password that you will need to replace. 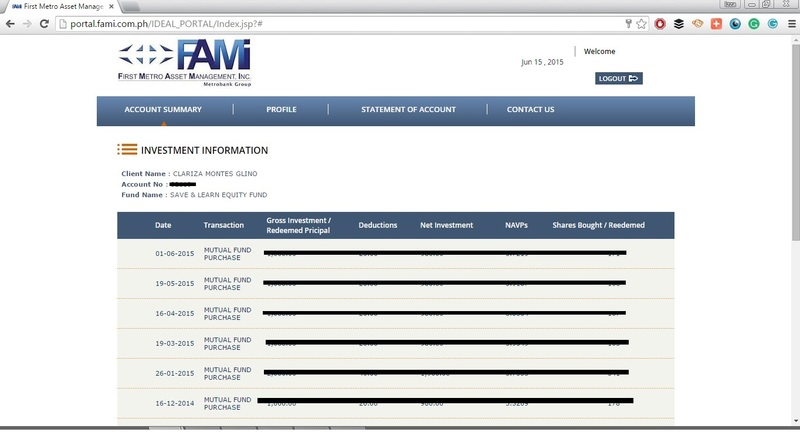 I believe I had showed a screenshot of the former FAMI Portal on a Reader Question on How to Manually Compute for Mutual Fund Earnings. You can read that post to learn more but I also have the screenshot below. 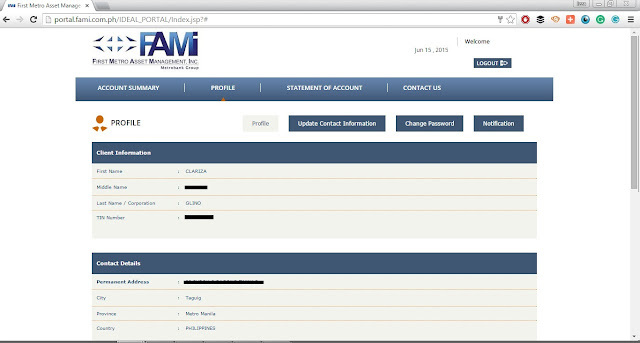 Honestly, the past FAMI Portal is hard to navigate and understand. There are too many empty spaces that I believe can be maximized. There are also terms that are available in the tables whoch are confusing especially for beginners. I don’t usually check my FAMI Portal. I guess I only do it once or twice a month if I wanted to know whether my investments were remitted. The FAMI Portal is very useful because I don’t have to manually compute as to how many shares I have, how much I already gained and so on. I have a quick dashboard of everything that I need to learn for my FAMI-Save and Learn Equity Fund. The whole look and feel of the website actually changed. The most dominant color became blue and I just love the simpler design. Same as before you need to Customer ID and Password to Login. If ever you forgot your password then you can just click the link available and a generic password will be sent in your email. Automatically you need to change this generic password to your new password. This acts as the home page of the portal. A quick table of all the important information of your account. You have your Account Number, Account Name, Fund, Net Investment, Shares, NAVPs, Current Value, Gain/Loss and a View Statement. 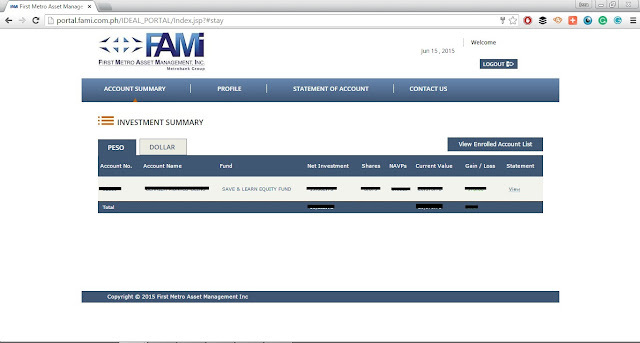 FAMI also offers Dollar accounts so if and then you diversified your investments and have a Dollar Account you can just switch tabs to view. Once you click View below the Statement you will have a new quick table. This is called Investment Information which gives your Investment History. It provides detailed information of all your investment transaction which is very useful to know exactly how far you are with your investments. If you want to see, update and change the password of your profile then this is the page that you should go. You can also click Notification if you want to receive NAV Report, SOA Report or Summary Report via Email or SMS. This page is official summary of your FAMI account. You can choose to view Statement of Account and Historical NAVPs to view and Download to PDF. If you have any concern then the Contact Us page gives all the details where you can submit your inquiry. There’s also a big Write to Us page for a more detailed customer support. I just love this change that FAMI created for the Investor’s Portal. I love the simple design, the bigger fonts and the easier to understand terms. I find myself checking the page more than the usual. I highly suggest all FAMI inevstors to create their own account. So far I am very happy with my investments with FAMI and I am looking forward for the brighter future ahead of me. How to Handle Bill Payments like a Boss – New! The Rule of 72: The Classic Computation every Investor Must Know – New!